Nestled in the peaceful hills of Chiang Mai province, RETURN TO THE SOURCE offers a specially extended (6 days/ 5 nights) retreat filled with yoga, meditation and dharma talks that will rejuvenate the body, mind & spirit! Led by Gaelen Hanson & Neil Jefferson, two of Chiang Mai’s most beloved and experienced Yoga teachers, RTTSYS aims to provide a richer and more thorough context for the practice of Yoga. Traditional yogic texts and concepts are studied and discussed in our daily dharma talks, and our asana classes are enhanced and complimented by our regular practice of meditation and pranayama. meaning of Yoga and a deeper understanding and acceptance of our own true nature. The beautiful Amaravati Ashram is the perfect setting for this inspiring and rejuvenating retreat. “RETURN TO THE SOURCE” with a week of focused practice that will leave you feeling refreshed and inspired. -The retreat concludes at 3:30pm on January 16.
required to secure your booking. As a former professional dancer and critically acclaimed choreographer, Gaelen brings a wealth of kinesthetic experience to her yoga teaching. 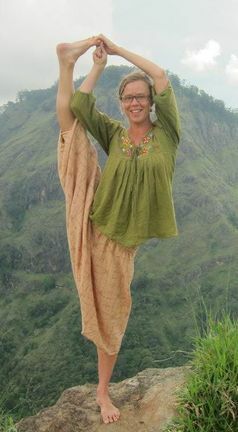 Gaelen’s unique style also combines aspects of Vini Yoga, Vinyasa Yoga and Iyengar Yoga, and her thoughtfully choreographed classes emphasize the flow of breath as a tool to bring us into a state of dynamic presence. Gaelen’s Yoga & Mindful Movement classes are designed to strengthen and revitalize the physical body, quiet and focus the mind and rejuvenate the spirit. As a teacher she is known for her calm clarity, supportive encouragement and graceful practice. Gaelen inspires students to challenge themselves in a mindful way. She believes that the essence of Yoga is not the pose, but the state within the pose; encouraging students to let go of the reactionary mind and open up to present moment without judgment. Originally from the UK, Neil has been living in Asia since 1997. He has been practicing yoga for 17 years and has been teaching in Thailand since 2011. He brings to his classes a unique fusion of the many teaching styles (Anusara, Iyengar, Sivananda) and teachers he has studied with. Neil’s students enjoy his calm presence in the class, and his clear and concise alignment instructions. He invites students to utilize the flow of the breath as a primary focus to still the mind while moving the body. Neil’s yoga journey continues first and foremost as a student; he travels to India every year to spend time with his teachers, looking deeper into the non-physical elements of this ancient wisdom. He has a passion for inquiry into the true nature of reality (which he believes can be accessed in our present experience) and sharing this understanding with his students and friends.